Will Arizona's cowboys and Latinos vote for Clinton or Trump? Immigration and US border security have been among the most contentious issues in the 2016 presidential campaign. The issues are particularly divisive with those Americans in Arizona who live next to the border with Mexico. In the land where time stands still a lone horse whinnies and the sound ripples across the windswept brush. The horse has sensed something before we see it. Soon a line of dust rises in the distance and a rumble reaches the ranch. 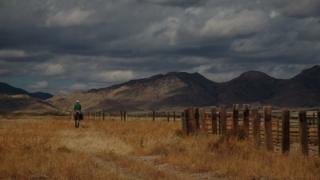 Across the Arizona plain 450 cattle are on the move herded by five rugged cowboys on horseback, chaps and all. It could be a scene from any Western and the cowboys' stories could be the script. They talk of Mexican "outlaws" crossing the border, some parched and desperate, others laden down with drugs. They talk, too, of a rancher shot dead on his own land and of a law-enforcement officer killed in a gun battle, both in dubious and disputed circumstances. The cowboys want a secure border and when it comes to politics these men of the West do not mince their words. 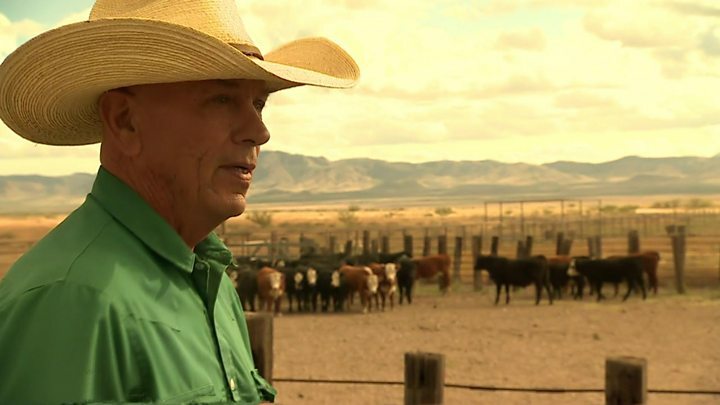 "The thing about Trump," says Ed Ashurst who owns this ranch, about 20 miles north of the Mexican border. "You might hate his guts but he'll probably do something. And Hillary Clinton, I'll guaran-damn-tee it, ain't gonna do anything. So your choice." "If," he adds pointedly, "you're an American citizen." Immigration is a big issue here. Southern Arizona, built on copper and cattle, is a relatively new part of the United States and its history is intertwined with Mexico's. It became a territory in 1853 as part of the Gadsden Purchase from its southern neighbour. Arizona itself only achieved statehood in 1912. According to the federal government, the latest statistics suggest that far fewer Mexicans and single adults are attempting to cross the border illegally but "more families and unaccompanied children are fleeing poverty and violence in central America." The cowboys are not convinced. But in the frontier town of Nogales - 95% Latino - many people do hate Mr Trump's guts. The Republican candidate has called Mexicans "criminals" and "rapists", pledging to deport millions of illegal immigrants and to build a great wall on the border. He has also, infamously, insulted women, time and again. And yet the Republican headquarters in the town is packed with young Hispanic women using mobiles to make calls to potential Republican voters, urging them to back the New York property tycoon for president. What is going on? Catalina Miranda, who is in charge of the volunteers, sighs and then smiles when she is asked about Mr Trump's controversial comments. The 19-year-old admits that she was offended, saying "I am a very proud Latina", but insists there are more important issues in the US presidential election than pride. "We don't have to look at the personal stuff right now," she says. "Right now we have to think business-wise. This town needs businesses. This town needs more people." On the doorsteps in Nogales, though, Democrats are delighted to talk about Mr Trump's personality. Molly Anderson, a physician, is canvassing in streets which afford a view over the border to Mexico, where the frontier town is also called Nogales. "These are families who share a border," she says. "Everybody in Nogales is related to somebody in Mexico." Dr Anderson says her party's presidential opponent is driving many voters to register for an election for the first time in their lives. "I have never seen people coming up and registering emphatically like this," she says. "They're telling us that they don't like what Trump has to say about Mexican Americans and about Mexican immigrants and that they're going to make a statement this year about it." That would be a big boost for Hillary Clinton. The last time Arizona picked a Democrat for president was 1996 when her husband Bill won here. It was the first time the state had turned blue in 40 years. Four years ago, the Republican candidate Mitt Romney triumphed emphatically here, winning by nine percentage points. Only four of its 15 counties went Democratic, including Santa Cruz where Nogales is the county seat. If his wife can repeat the feat, and take another 11 electoral votes as she tries to reach the winning margin of 270, she will have her opponent to thank for alienating millions of Latino voters. Winning here may be a struggle though. Polls had suggested that the race was a toss-up in Arizona and, unusually, the state has been visited this week by both Mrs Clinton and her vice presidential candidate Tim Kaine, who made history by delivering an entire campaign speech in Spanish. However the latest polls indicates that Mr Trump has gained ground on his opponent, leading her by five points among likely voters, 45% to 40%.